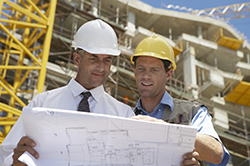 Maintaining accurate books can become a challenge for busy construction businesses. If you need help managing your finances, our Fort Wayne, IN CPA firm is at your disposal with an array of construction accounting services. While you’re out building up our community, we’re focused on caring for your daily accounting needs and constructing a tax planning strategy that will allow you keep more of your profits. Whether you’re in commercial construction, are a residential contractor, or a local tradesman like an electrician or plumber, we’ll roll up our sleeves and work hard to keep your business fiscally sound. We have extensive experience with businesses like yours, so we can deliver the specialized construction accounting services your industry requires. We offer job estimating and fixed asset accounting along with traditional accounting and tax services, like cash balance tracking, monthly closings, and sales tax processing. Our CPA firm truly understands accounting and bookkeeping for your industry. Call FOUDY CPA GROUP, PC today at Fort Wayne: 260-432-4565 or Bluffton: 260-824-1040 or request a consultation online.